This book introduces the state-of-the-art in research in parallel and distributed embedded systems, which have been enabled by developments in silicon technology, micro-electro-mechanical systems (MEMS), wireless communications, computer networking, and digital electronics. These systems have diverse applications in domains including military and defense, medical, automotive, and unmanned autonomous vehicles. 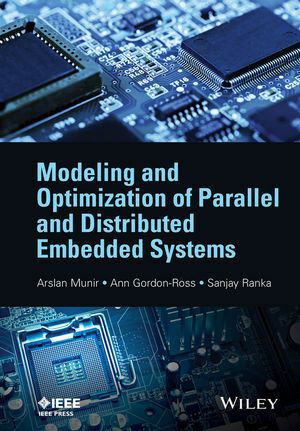 The emphasis of the book is on the modeling and optimization of emerging parallel and distributed embedded systems in relation to the three key design metrics of performance, power and dependability. Includes an embedded wireless sensor networks case study to help illustrate the modeling and optimization of distributed embedded systems. Provides an analysis of multi-core/many-core based embedded systems to explain the modeling and optimization of parallel embedded systems. Features an application metrics estimation model; Markov modeling for fault tolerance and analysis; and queueing theoretic modeling for performance evaluation. Discusses optimization approaches for distributed wireless sensor networks; high-performance and energy-efficient techniques at the architecture, middleware and software levels for parallel multicore-based embedded systems; and dynamic optimization methodologies. Highlights research challenges and future research directions. The book is primarily aimed at researchers in embedded systems; however, it will also serve as an invaluable reference to senior undergraduate and graduate students with an interest in embedded systems research. Arslan Munir is currently an Assistant Professor in the Department of Computer Science and Engineering (CSE) at the UNR. Before then he was a postdoctoral research associate in the Electrical and Computer Engineering (ECE) department at Rice University (Houston, Texas) between May 2012 and June 2014. He received his M.A.Sc. in ECE from the University of British Columbia (Vancouver, Canada) in 2007 and his Ph.D. in ECE from the University of Florida (Gainesville, Florida) USA in 2012. Between 2007 and 2008, he worked as a software development engineer at Mentor Graphics in the Embedded Systems Division. His current research interests include embedded and cyber-physical systems, computer architecture, parallel computing, fault-tolerance, and computer security. Anne Gordon-Ross is currently an Associate Professor of Electrical and Computer Engineering at the University of Florida and is a member of the NSF Center for High Performance Reconfigurable Computing (CHREC) at the University of Florida. She is also the faculty advisor for the Women in Electrical and Computer Engineering (WECE) and the Phi Sigma Rho National Society for Women in Engineering and Engineering Technology. Her research interests include embedded systems, computer architecture, low-power design, reconfigurable computing, dynamic optimizations, hardware design, real-time systems, and multi-core platforms. Sanjay Ranka researches energy efficient computing, high performance computing, data mining and informatics at the University of Florida's Department of Computer Science. He has coauthored two books, 75 journal articles and 125 refereed conference articles. He is a fellow of the IEEE and AAAS, and a member of IFIP Committee on System Modeling and Optimization.